In the current article we’ve created a list of the best dog shampoos. You are welcome to look through the rating and select the optimal hygiene product for your pet. Besides, you’ll find out how to apply the shampoo properly and what will happen if you do it wrong. High-quality dog shampoo is not just something that cares about your dog’s health and appearance. A professional dog shampoo saves time and money as well as preserves dog owner’s nerves. After washing the dog with such a shampoo its hair stays clean longer, it is easily combed and sheds less. An aggressive shampoo can make your dog’s hair look a mess or cause dermatitis just after one application. In this case visiting a vet is inevitable. 2 How often should you wash your dog? 3 What happens if you wash your dog too frequently? 4 How to apply dog shampoo? One of the most frequently asked questions is if it’s ok to wash a dog with a shampoo for human hair. The main rule you should follow strictly regardless of the dog’s breed, hair length and other physiological makers – you mustn’t wash a dog with a shampoo made for human hair. Of course, if you do it just once, it won’t harm the dog greatly. Though if these are allergy-prone puppies, even one washing with a shampoo for human hair may cause an adverse effect. Dogs have a special chemical barrier on their skin surface. It is made from oil and sweat glands secretion. This sticky layer protects dog from UV rays, ensures dog’s hair and skin elasticity as well as it has water-repellent properties. Humans and dogs have different skin acidity (pH). Human’s pH is about 5,5 and shampoos for human hair are more alkali-containing. Dogs have one of the highest skin pH. In average it is about 7–8 depending on a dog’s breed. Shampoos for human hair will cause excessive drying of dog’s skin and hair. All beauty care products for dogs have low pH level and due to this they not only clean pets hair and skin, they also moisture it and preserve the protective fatty layer. Besides, zoo cosmetics almost doesn’t contain any synthetic components – dyes, fragrance components etc. That’s why you shouldn’t use shampoos for human hair to wash your dog and should buy specialized dog shampoos instead, which are more soft and provide tender care for their skin and hair. All beginning dog-fanciers ask these questions: How to wash a dog? How often and how to do it properly? Not so long ago it was advised to wash dogs not more often than twice a year. However, things are changing and those stereotypes are now in the past. Nowadays, vet doctors are consentient as for the idea that: dogs should be washed as and when necessary. How often you wash your dog depends on many factors including the place of living. In a big city you’ll have to wash your dog more often: dust and other contaminants fall on the dog’s hair. If the dog lives in a crate in the country, you will wash it less often. Unfortunately, there is no answer that will work for all cases. Vet doctors say that washing a dog once in 5-6 weeks is the best decision, but you have to keep in mind that this is an approximate figure. In any case try not to wash your dog with shampoo all the time. If you just need to wash the dirt away – try to do it just with water. If you can’t remove it with water, use dry shampoos. You’ll find information about them at the end of our article. What happens if you wash your dog too frequently? Washing your dog too often may cause changes of dog’s skin рН, irritations and c. You will wash off the protective fatty layer that covers dog’s hair. 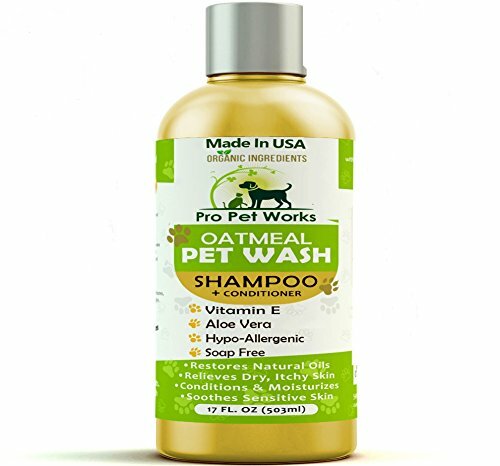 How to apply dog shampoo? Don’t pour it right from the bottle, but dissolve it into a volume with some water. Rinse dog’s hair for quite a long time to make sure that there’s no shampoo left on its skin (hair), otherwise it may lead to skin irritation. There shouldn’t be any draughts in the room while you are washing your dog and after that. An hour before the procedure close all doors, windows and other sources of air circulation. Turn off air conditioner and if it is winter heat the air in the bathroom with a heater. If the dog is large, wash it in a dog-collar, holding it during the process. This will help you both to control the washing procedure and to clean the collar from dirt and dust. Keep in mind that although flea collars like Seresto are water-repellent, but they become less efficient after they get wet. Therefore, it’s better to take them off before washing the dog. Make sure that the soap solution or water won’t get into your pet’s ears. If the dog has cropped ears use a special cap or a shower cap. Otherwise, don’t wash dog’s head at all. If the dog is large, cover one part of the bath with a towel or a bed sheet. While washing a pet may try to run away and its wet paws may slip and there is a danger of breaking a paw. If the dog may try to bite its owner, put a muzzle on it. Nynole muzzles are more preferable. This will save you from bruises and the bath from scratches. Before you start washing the dog put a long sleeved shirt, because after washing the dog will start shaking itself down and want you to take it into your hands. Such a behavior is considered to be normal, but you have to protect your hands from scratches. While washing try to calm the dog down with soft words, don’t raise your voice. If you see that the dog is scared, stroke it and say something like ‘Good boy!’ When you finish washing the dog give it some dainty to praise it. After washing you should wipe the dog almost completely dry. It is especially important in autumn, winter and spring. Prepare 5-8 towels according to the dog’s size in advance. It is not recommended to dry dog’s hair with a fan, but if there is such a necessity put the lowest power mode and use cold air (‘snow flake’ mode). Don’t comb dog’s hair while drying it to avoid skin injuries. Never take the dog for a walk after washing it. Wait for 2-3 hours to make sure that the hair is dry. Don’t stop the dog from running around the house after washing – this way it tries to get warm. Here there is a wide variety of shampoos to choose from and it’s not that easy to do. Not always your pet can do with an ordinary shampoo. Sometimes its skin and hair require medical care and treatment. It is better to give preference to shampoos with low content of various chemical additives and fragrance components. The more natural the product is, the better it is for your pet. As a rule a good dog shampoo costs more, than that for human hair. However, you wash your pet more seldom and it means that you’ll be able to use such a shampoo for a longer period of time. Even if after the first washing you didn’t get the result you were expecting, don’t try another product the very next time. You should use it several times and then check the state of your pet’s hair. Read all the information on the label, since quite often such products have some specific features. In most of cases a high-quality shampoo effects the pet’s hair state after 3-4 times you use it. In this case the hair will stay clean and look good for up to 4-5 weeks. It will stay shiny, won’t tangle or become matted. If the dog is an allergy-prone one, it’s better not to experiment and choose a hypoallergic treatment shampoo on your own. You should consult a vet doctor and find the reason of such a reaction. If you pet has highly sensitive skin and it often suffers from various allergic manifestations you can get a shampoo with aloe vera as one of its components. Dandruff may appear because of eczema or seborrhoea, these states are accompanied by excessive sebaceous secretion. In this case a shampoo with coal tar will help. Tea tree oil or extract is an efficient antiseptic therefore shampoos containing this component can be used for problem-prone skin. It is not that easy to choose the best dog shampoo taking into account that they have several purposes. We decided to divide the shampoos into three categories (hygienic, treatment, dry) and choose the best among them. To make the rating more reliable we included both leading trademarks on the market and not very popular, but high-quality products. Things are quite easy if a dog has healthy hair and skin. Though, when it is required to add some shine to dog’s hair or make it more soft or coarse, it is hard to choose a proper shampoo. The main problem is that dog owners expect to see the result immediately. For example, they expect a lightening dog shampoo to remove yellowish tint from the dog’s snout and paws from the very first washing. And then it goes as follows – they buy a bottle, try it, it didn’t work from the first time and they throw it away. Then they buy another one and dog’s hair is white again – perfect! However, actually this is a result of coarse cleaning, which is impossible without aggressive chemical components. 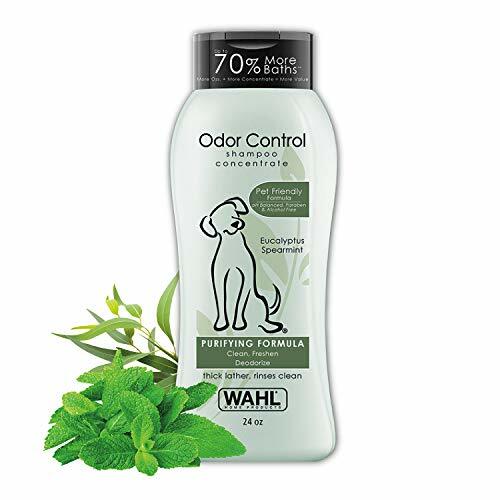 As a result, dog’s hair loses its protective layer and gets dirty faster and then you have to buy this shampoo for dogs with white hair more and more and wash your pet almost every week. And it’s no wonder: cuticle of hair is damaged and dirt easily gets inside the hair. All you have to do to find solution for some specific issues is to read attentively shampoo components and how it acts. If your dog has dry, tarnish and matted hair you need a shampoo with keratin proteins, mink oil, vegetable oils, panthenol. Irritated skin, scratches require a soothing dog shampoo with chlorhexidine, herbal extracts, menthol, vitamin E.
For bristled up and unruly hair you need a shampoo with ‘liquid silk’, various proteins, antistatic components. High-quality shampoo effect becomes visible after 3-5 times you wash your pet with it: the hair stays clean for at least three weeks, it doesn’t become matted or static, it shines, smells good (however, without this strong smell of fragrance components). But when you need a hypoallergic dog shampoo it’s not the time for experiments. It’d be reasonable to go to vet doctor straight away to define which component causes such abnormal immune response. And even knowing that your dog is an allergic-prone one still it is difficult to choose a shampoo without consulting a vet doctor, since various manufacturers may call one and the same component in a different way. Unlike the previous product this shampoo has received very good feedback from users. What it is aimed at is clear from its name. The shampoo contains aloe vera that kills harmful bacteria causing foul smell of dog’s skin and fur. It also eliminates other organic smells. It provides moisturization and deodorization of dog’s hair, reduces shedding, gently cleans dog’s hair and makes it healthy and shiny. The fresh smell after washing stays for a long time. This is one of the most popular dog shampoos on Amazon.com. It has various odors, lots of positive reviews and different applications. You will find shampoos for dogs with dry, irritated skin, against matted hair and many other. It has no parabens, phosphates, synthetic dyes, perfumes, gluten DEA, enzymes or SLS/SLES. 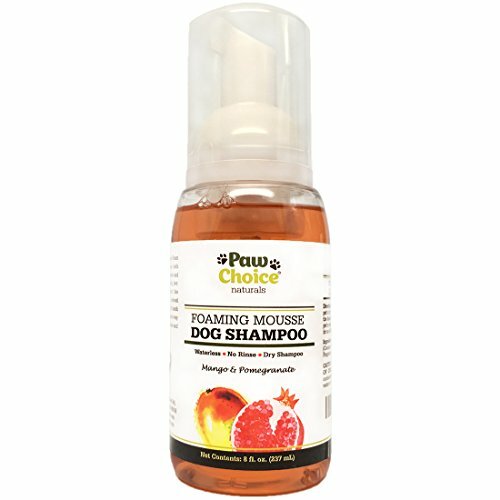 Paws & Pals is a multi-purpose shampoo that can be used both for cats and dogs. The manufacturer recommends it both for dry and sensitive skin. Natural components (aloe, jojoba and coconut oils) are used to reduce irritation and itching caused by various skin injuries (insect bites, scratches, irritations). Besides, the shampoo formula contains only natural components and tear free formula. 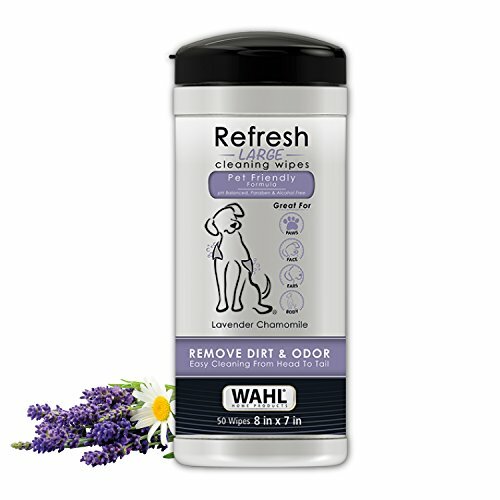 Wahl Dog/Puppy Shampoo is not just one shampoo, this is the whole product line of various care products for dogs. Here you can find both an ordinary dog shampoo and shampoo for dogs with white hair (whitening shampoo), deshedding shampoo. They also have shampoos with natural components to scare off various parasites (flea and ticks), for irritated skin, deodorizing shampoos and those for puppies with soft and sensitive skin. At that the company products have high rating and more than reasonable prices. Everyone can find exactly what his dog needs within these products! 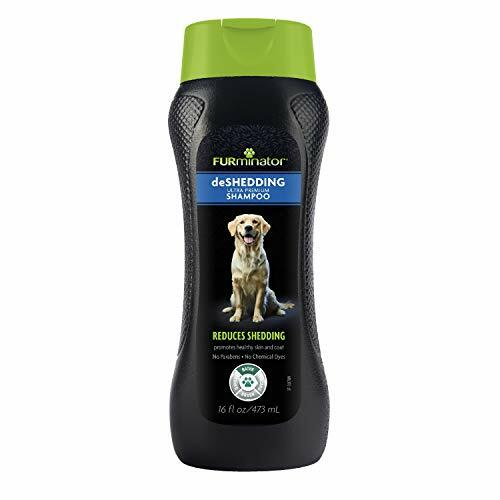 This is a multi-purpose shampoo that can be used both for dogs, cats, horses, rabbits and ferrets. Its main feature is 100% natural composition made for sensitive and irritated skin. The shampoo contains almond oil, organic aloe vera gel and vitamins A, D & E.
Let me emphasize at once, that to solve any problem you pet has with its skin or hair you can choose more efficient remedy than a shampoo. Because, shampoo is just a cosmetic product, which is also efficient, but it shows less effectiveness than some specialized medicated products. Medicated dog shampoos act slower and are less efficient than some specific medicated products. But they should be prescribed by a vet doctor, however, sometimes you don’t have a chance to visit him. Here are some tips you may find helpful in this case. Dog flea control shampoos may contain either natural components and/or chemical substances (poisons). Of course, natural components are less effective and they can’t kill all insects at once. Chemical components work faster, but their amount in the shampoo is very small, that’s why the manufacturers add potent agents into it, which are harmful both for a dog and its owner. Besides, there in no such a dog shampoo that deals with parasite eggs and it still doesn’t kill the parasites, but just paralyses them. It’s better to buy a flea collar, than to kill the parasites by means of the shampoo. Pyodermatitis, eczema, staphylococcal infection and other diseases are cured by various medicines, but most of dog shampoos contain just one therapeutic agent or a combination. Dog shampoo with chlorhexidine can be used as a preventive remedy against chronic skin problems. However, you still need to consult a vet doctor. It is also hard to get rid of both pathogenic fungi and bacteria, therefore a shampoo is just a preventive in this case. And it may even get worse, since sometimes washing only makes things more complicated: fungi spores are spread over dog’s skin after washing and the disease worsens. That’s why it’s better to use antifungal dog shampoo only if a vet prescribes it and after performing a bacterial test (to define the type of fungi). And at the end, I’d like to say a few words about dandruff. In the most of cases anti dandruff dog shampoos provide only cosmetic effect – they wash away excessive sebum and exfoliated skin furfur with surface skin fat. To get rid of dandruff once and for all pay attention to the dog’s diet and try to change the dog shampoo you are currently using. Sometimes the problem is in improper diet or shampoo. If all these don’t help, you should consult a vet. Possibly, the dog has some fungi infection. 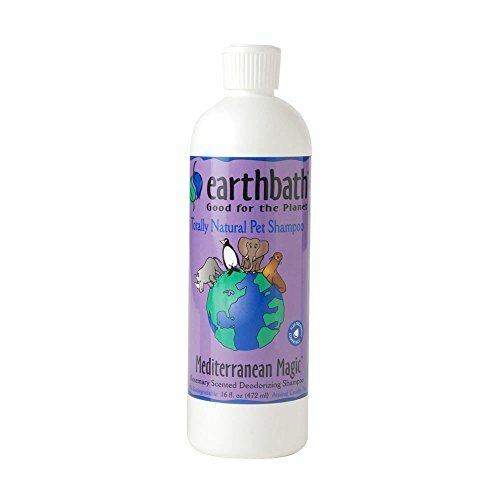 This shampoo is developed to treat topical fungal and bacterial skin infections of horses, dogs and cats. The main active component is miconazole and/or chlorhexidine. Miconazole – is a drug for local treatment of the majority of fungous disease including dermathophyte, yeast fungus and yeast-like fungi, candida infection of the skin. Chlorhexidine – is an antiseptic drug used as Chlorhexidine bigluconat is medicines. Chlorhexidine has been successfully used as a skin antiseptic and disinfectant for over 60 years already. This shampoo also contains Chlorhexidine. This is a substance that kills the majority of gram-positive and gram-negative bacteria. Due to antibacterial effect it also provides deodorizing effect. The shampoo provides antiparasitic and antiseborrheic action, helps to get rid of fungal and bacterial skin infections. Keep in mind, that unlike the previous shampoos it is not recommended for cats. As well as its composition is also different, it has other components – Salicylic Acid, Coal Tar & Micronized Sulfur. Salicylic Acid has weak antiseptic, irritating and keratolytic properties (in high concentration) and it is used externally as creams or solutions when treating various skin problems. Ketohex its antifungal and antibacterial shampoo for use on dogs, cats, and horses. We added it to the list for two reasons: high efficiency and it has Ketoconazole as the main active component. This is an antimycotic agent effective against dermathophyte, dimorphic fungi. This substance is also efficient against staphylococcus and streptococcus. If all above mentioned shampoos didn’t help, you should try Ketohex. Ketohex is an antifungal and antibacterial shampoo for use on dogs, cats, and horses. Spray and dry shampoo for dogs are great inventions. However, this is a temporary and emergency measure which doesn’t substitute washing the dog. It can be used on the road and at dog shows; on little puppies (if it harfs, pisses in a box or gets dirty with something you can’t remove with a wet wipe); on pregnant and sick dogs (because after washing they can be stressed, suffer from hypothermia or may hurt themselves). But applying dry shampoos all the time is very harmful for your pet. Its hair will be damaged and oil glands function will be disrupted. Using dry shampoo on your dog doesn’t require any experience or some special skills. You just worm the powder into the dog’s hair trying to reach to the skin and then comb the dog. The same way you use a spray shampoo for dogs. Just instead of powder you spray the liquid over the dog’s hair. The substance absorbs excessive sebum and ‘couples’ dirt and dust. Then it is removed with a comb (if it is powder) or a towel (if you used a spray). Miracle Coat Premium Dog Shampoo 32 oz. 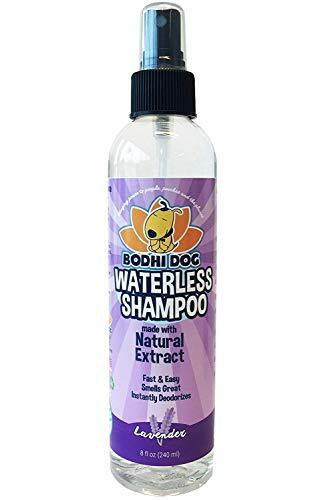 As a rule these shampoos give temporary effect: even rather thorough combing or cleaning with a towel doesn’t remove the substance completely from the dog’s body. And at this point it starts working against you – it collects dirt and dust on the dog’s hair and skin. That’s why after using these shampoos you should wash your dog with an ordinary shampoo and water once you have a chance. This is a substance that helps to clean your pet’s hair during the time between the washing and make you dog look clean and fresh. It is PEG-80 Free, Alcohol Free, and Paraben Free. The manufacturer offers two shampoo odors you may choose from. Another substance to help you to quickly clean your pet’s hair. If you don’t have time or ability to wash the dog, just apply it on its hair. NATURAL COCONUT DERIVED FORMULA. Mild, safe and good for sensitive skin. No harsh chemicals and no sodium laureth sulfate. Miracle Coat’s Spray – apply it on dog’s hair, comb and dry it. 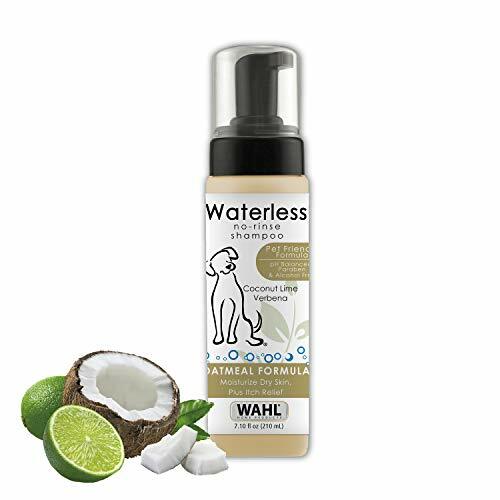 This spray will help you to keep your dog’s hair clean and prevents appearance of matted hair during the time between the main washing with water and shampoo. No time for bath? This shampoo keeps your dog’s hair shiny and clean. Doesn’t contain alcohol and soap. These are special wipes that not only remove dirt from your dog’s hair, but they are also antibacterial ones. They don’t contain alcohol.